Lacking a regular breakfast routine kept our ancient ancestors lean, and modern day research says it could even lead to weight loss. Breakfast, we are told, is the most important meal of the day. Over the last 50 years, we have been bombarded with messages extolling the health benefits of processed cereals and porridge oats. We are told breakfast helps us reduce weight by speeding up our metabolism – this helps us avoid hunger pangs and overeating later in the day. These are not just marketing messages, they are core to nutritional guidelines in developed countries, such as in the US, UK and Australia, prepared by expert scientific panels. These messages are mirrored in the media and websites worldwide. But what if the benefits of breakfast are just another diet myth? It’s popular these days to follow the nutritional regimes of our ancient ancestors, but no one seems to be studying whether or not they ate breakfast. The Hadza people in Tanzania are the last true hunter-gatherers in East Africa who we believe live much like our ancestors. Living with them, we noticed a definite lack of a breakfast routine. They also have no regular word to describe “breakfast”. After waking up, the men usually leave on a hunting or honey-gathering trip without eating, maybe grabbing some berries a few hours later, en route. If they stay in camp in the morning or even all day, a handful of honey late morning – or even consumed as late as early afternoon – may be all they eat until a larger, evening meal. That said, there is no routine and eating patterns are highly variable, depending on the camp size and season. 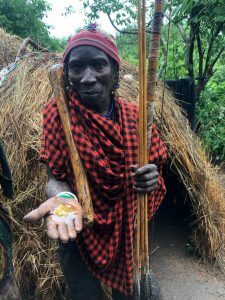 The women stay close to the camp and on some days make simple food, like baobab porridge, or they eat some stored honey, but rarely before 9-10am, giving them a fasting time since their evening meal of over 15 hours. Lacking a regular breakfast routine has not made them fat or unhealthy and they lack most Western diseases. Perhaps we should take a leaf from their book. At least, that’s what the latest scientific evidence suggests. 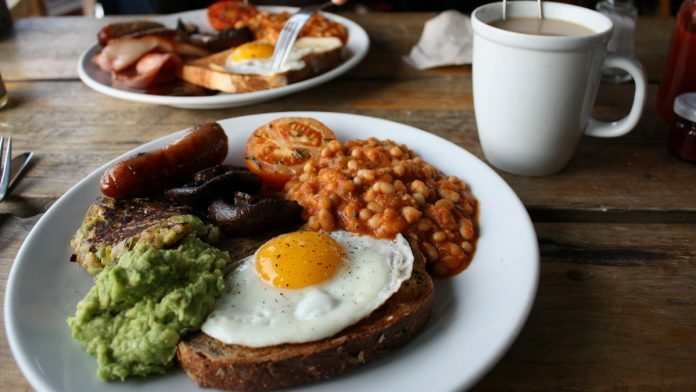 The health benefit of breakfast has now been completely debunked by a new systematic review and meta-analysis of 11 randomised trials that investigated the impact of skipping breakfast on weight and metabolic rate. The studies vary widely in duration and quality, and seven looked at changes in weight as well as changes in energy usage. Their conclusion is the same as in recent reviews that have been largely ignored, namely, there is no evidence to support the claim that skipping meals makes you put on weight or adversely reduces your resting metabolic rate. There is now considerable evidence from these studies that skipping breakfast can be an effective way to reduce weight for some people. So why has the field got it so wrong in the past? One reason is the belief in “grazing” rather than “gorging” to avoid “stress” on the body from having to digest large meals, especially later in the day when glucose and insulin peaks are higher and metabolic rate lower. The flawed rationale was based on lab rodents and a few short-term human studies. While the concept of over-compensation later in the day was correct – breakfast skippers do eat more lunch and slightly reduce their activity – it is not nearly enough to make up the energy deficit in a real-world setting outside a lab. Scientists were honestly misled in the past by many observational studies showing that obese people skipped meals more often than thin people. This mindset became ingrained in nutritional dogma. But these observational studies were seriously biased. Breakfast skippers were more likely, on average, to be poorer, less educated, less healthy and have a poorer diet. Overweight people were more likely to diet and, after a binge, more likely to feel guilty and skip a meal. Despite these flaws in the science and the steady increase in opposing evidence from randomised controlled trials, the idea that skipping meals is unhealthy has prevailed for decades. It’s still part of current NHS recommendations by Public Health England and one of its eight key healthy diet messages, part of USDA Dietary Guidelines for Americans, as well as the Australian Guidelines for Nutrition. Also read: Why are so many people getting a meat allergy? Another common pro-breakfast argument is that, as well as reducing obesity, it is essential for the mental well-being and attention span of children, even if well nourished. Again the evidence of over 20 trials, when reviewed independently, is at best weak and inconsistent, and probably biased in the same way as for adults. Evidence is also accumulating that restricted eating times and increasing fasting intervals can help some people lose weight. Some of these recent developments that seem counterintuitive to traditional thinking, make sense when we consider the importance of the gut microbiome on our health and metabolism. The community of 100 trillion gut microbes have a circadian rhythm and vary in composition and function in fasting and fed states. Data suggests microbial communities could benefit from short periods of fasting. They, like us, may need to rest and recuperate. Some of us are programmed to prefer eating food earlier in the day and others later, which may suit our unique personal metabolism. Around a third of people in developed countries regularly skip breakfast while many others enjoy it. This does not mean that everyone overweight would benefit from skipping breakfast. There is no one size fits all, and prescriptive diet guidelines filled with erroneous information look increasingly counterproductive and detract from important health messages. Different populations have their own varied breakfast habits, but before you next go hunting, why not try your own personal breakfast skipping experiments – it may suit you. This article was first published by The Conversation. You can read it here. Tim Spector is a Professor of Genetic Epidemiology, King’s College London. Jeff Leach is a Visiting Research Fellow, King’s College London. I am a pediatrician FROM Mumbai, I have benefited a lot by making two meals a day my routine. I have lost 15 Kgs and brought down diabetes indicator Hb1ac from 9 to 6.5 in 6 MTS. I eat my meals at 1pm and 10 pm with night Fasting time of 15 hrs. I take only water, green tea and butter milk in between. I followed Dr Jagannath Dixit’s diet and lifestyle plan. I’m personally a big defender of the high protein breakfast because protein are harder for your system to digest. Therefor, it activates your metabolism for the rest of the day and limits calorie intake.